Live it up in Las Vegas! Click here to play! Now is your chance to rub elbows with showgirls and Elvis impersonators while living the life of a high roller in the bright lights of the Vegas Strip. Vegas is all about the cash, especially if you're going to live the life of a high roller. Spin three or more stacks of cash and you'll get 300 times your original line wager. Any trip to Vegas wouldn't be complete without a show from Elvis, and a show you will get in Crazy Vegas! If you're lucky enough to spin five Elvis icons you will win 150 times your wager. The same can be said for the showgirls. Entertainers and Cards will pay up to 90 times your wager, while the dice (if lady luck is smiling upon you) will pay up to 45 times your wager. Of course there are all sorts of bonuses and comps when it comes to the Las Vegas casinos. You can earn free spins by collecting three free spin chips on selected reels and you'll be rewarded with a number of free spins. But the most exciting thing about Vegas is the bonuses. Spin the Big Bonus icon on reels 1 and 5 and you'll be sitting pretty with more cash than you'll know what to do with. It's time to live it up in Vegas high roller style. Grab Lady Luck and head for Crazy Vegas for the time of your life! The Crazy Vegas acts as a scatter symbol. Three or more of these flashy icons will award a prize of 5, 20 or 100 times your bet. The sparkling Crazy Vegas symbol also acts as a substitue. It will replace all symbols to create a winning combination. 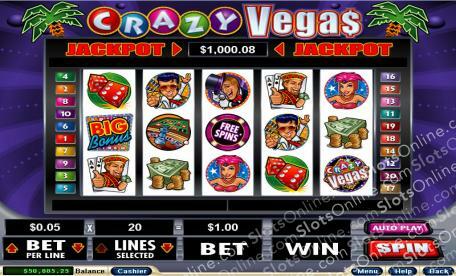 Three or more Big Bonus symbols triggers the bonus game in Crazy Vegas. It is a Wheel of Fortune type game that awards players with a cash prize and multiplier.